Small documents need protection too, and these sheet protectors are up to the challenge. The heavyweight material is just as durable as C-Line's letter-size sheet protectors. 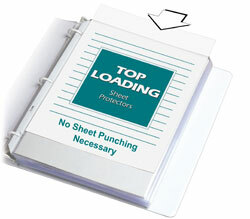 Mini sheet protector fits mini or executive size binders. Holds 8.5 x 5.5 inserts. Clear finish. Photocopies won't stick. No sheet punching necessary. Acid-free. Also good for scrapbooking use. Mini Size Document Storage --- Although you can put a small document into a large sheet protector, sometimes it’s nice to have the right size for the job. C-Line has created the mini size sheet protector to accommodate these smaller 8-1/2 x 5-1/2 sheets. Mini sheet protectors provide safe protection and fit in standard 3-ring executive or mini binders. Three-Hole Punched --- Sheet Protector is three-hole punched. Sheet Protector Special Features: Polypropylene, top-loading sheet protectors preserve and protect high-use presentation materials, letters and reports. Suggested Use: Durable storage for documents and reference materials that are 8 1/2 x 5 1/2. Hi. I'm John at C-Line. And today, we're going to talk about our Heavyweight Mini-Size Sheet Protectors. These mini sheet protectors are perfect for storing a half sheet of standard size paper or any 8 1/2" x 5 1/2" information in a three-ring binder. They can be used for storing everything from recipes and playbills to sales and reference documents. Available in a clear finish, these heavyweight sheet protectors provide extra durability for storing frequently used materials. Because it's made from acid-free polypropylene, print from your documents won't stick to the sheet protector. The strong reinforced binding edge helps to prevent pages from tearing out of binders, even with heavy use. And the top-loading design means you don't have to punch holes in your pages before you can store them. Mini sheet protectors fit mini or executive size binders and provide compact storage for your 8 1/2" x 5 1/2" inserts. They're a great organizational tool for home, school and business. Order yours now! That's all we have for today. I'm John with C-Line. Thanks for watching.